Have gazed and gazed thy antique form upon? Today the Hemlock Stone (129:49953866) is largely disregarded, to the extent that in the last few years it has been removed from the list of 'sites of special scientific interest.' The old idea of the stone being nothing more than the result of bad quarrying is once again popular and has probably been encouraged by property developers with an eye on the land surrounding the stone. This current lack of interest in the Hemlock Stone has not always been the case and the folk-lore and legends woven around such stones are an essential part of our heritage. Legend has it that the Hemlock Stone was hurled at Lenton Priory, some four miles west of the stone, by the Devil. This tale of the Devil or some mischievous force hurling a stone and missing its mark occurs throughout the folk-literature of Europe. It is generally accepted that such legends reflect conflict between the early christian Church and their pagan contemporaries. The tale is more often than not associated with prehistoric sites like the large monoliths or standing stones erected by neolithic and bronze age man. Such stones were the centre of pagan worship well into the christian era. It is interesting to compare the Hemlock Stone and Kinoulton legends in more detail. Both stones were believed to be missiles of diabolic origin aimed at ecclesiastical sites, Lenton Priory and Kinoulton church, respectively. The sites from which the stones were reputedly hurled are also of interest. Both are approximately thirty miles from their targets and both have legends of demonic occupants. The Hemlock Stone was reputedly hurled from the hill above Castleton in Derbyshire. Below this hill, upon which stands Peveril Castle (from which the town derives its name), is the Treekcliff Cavern. This massive limestone cave, once the home of prehistoric man, is reputed to be one of the entrances to the 'underworld' and the haunt of the Devil. Moreover, when heavy rain issues from the cave in the form of streamlets, it is said to be the Devil urinating. In the case of the Kinoulton stone it was supposed to have been thrown from Lincoln Cathedral, where the Devil once let loose that evil entity 'The Lincoln Imp' who, after running amock, was turned to stone by an angel. To return to the Hemlock Stone and how attitudes have changed regarding such wonders. Writing in the mid-eighteenth century, Dr Spencer Timothy Hall, a.k.a. 'The Sherwood Forester' , provides us with yet more reasons for believing that the Hemlock Stone was once venerated by our pagan forefathers. The good doctor believed the stone to be of natural origin but to be man-enhanced, the result of deliberate quarrying. He goes on to say that when he was a young boy the old folk could remember a time when a fire was lit upon the top of the stone annually on Beltane Day. Nearby the Hemlock Stone was once the 'Sick Dyke'. This spring was regarded as a healing well, especially effacacious to rheumatism sufferers. More than one writer on the subject has suggested that the ell was connected with rituals performed at the Hemlock Stone. 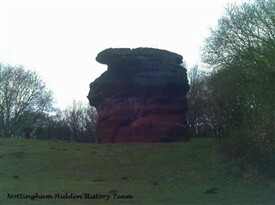 The Hemlock Stone also has connections with three other stones, a possible standing stone on the nearby Crow Hill (50403805) and two other local landmarks, the Cat Stone at Strelley (5074154) and Bob's Rock at Sandiacre (49333732). Another fascinating Nottinghamshire stone about which little has been written is the Druid Stone at Blidworth (120:586556). This stone is an eroded glacial deposit, a conglomerate of pebbles and sand, cemented together by stalagmatic limestone. It is over fourteen feet high and has a curious hole bored through it in its base. Through this it is possible to enter the stone looking to the east to see a hole or window cut in the far wall. It has long been claimed that this hole is aligned to the midsummer sunrise. However, a survey carried out by Barry Christian some ten or more years ago revealed that it is in fact aligned to Thom's megalithic May Day sunrise (1800 to 1700 BC). Like the Hemlock Stone this stone may well have been associated with the Celtic Beltane. 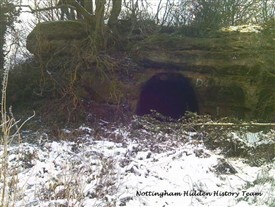 Close by the Druid Stone are the sites of a number of prehistoric tumuli and within a few miles the legendary Friar Tuck's Well at Fountaindale and yet another of Nottinghamshire's 'old stones', the Forest or Lyndhurst Stone which marks the site of a large boulder called the White Stone (55855800). 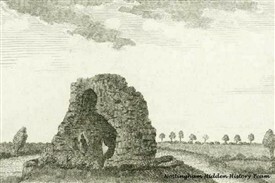 This article contains references to just a few of Nottinghamshire's 'old stones'. I hope that it serves to provoke interest in these ancient landmarks. From Original Research by Frank Earp and Pete Hannah . Originally published in Mercian Mysteries, No.6 February 1991. With Thanks to Bob Trubshaw. This page was added by Joseph Earp on 12/03/2013.